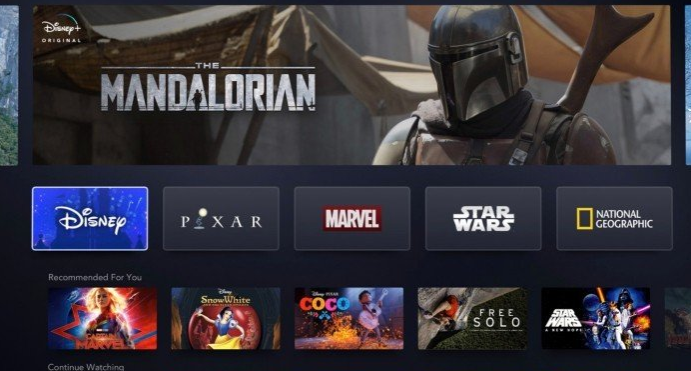 The Walt Disney Company unveiled its long awaited streaming service Disney+ on Thursday. The service is loaded with quality content, and is being priced at a substantial discount to Netflix. Disney will take a short term step back financially, but will generate enormous annual cash flows as the operation scales up in the years to come. After a long wait, The Walt Disney Company (DIS) finally revealed details surrounding its Disney+ streaming service at its Disney Investor Day on Thursday afternoon. Disney has spent billions of dollars acquiring a combination of technologies (BAMTech) and content assets (21st Century Fox) in recent years to prepare for a battle with its own version of the all-powerful "Thanos" in streaming pioneer Netflix (NFLX). There are a lot of exciting aspects to what Disney unveiled, and we will break down what they mean to investors. With that said, shareholders need to realize that Disney isn't trying to replace Netflix by next year - they are in the "end game" now. This can mean long-term wealth creation for those with the willingness to hold this blue chip over the long term. It's no secret that Netflix's role as pioneer has given it a massive head start over competition in the streaming space. The risk Netflix has undertaken as innovator has rewarded it with a massive subscriber base that now totals approximately 140 million members worldwide. In addition, the service will be ad-free and allow for content to be downloaded to devices for offline viewing. This collection features strong quality (multiple box office blockbusters present), and replay value. A strong portfolio is probably a given considering Disney's vault of content, and key demographics desire this content. The largest concern about the service, was how much Disney would try to charge for it. Disney has decided to put out a very low price of just $6.99 per month, or $69.99 as a 12-month lump sum. In other words, for less than a Big Mac value meal per month, consumers can enjoy hundreds of hours of high-quality content. This is a drastic undercut to Netflix's current standard subscription cost of $12.99 monthly (4K upgrade will cost you $15.99 per month). The key to understanding Disney's strategy, is that it isn't trying to dominate Netflix from day one. Starting from zilch against a 140 million subscriber behemoth requires a short-term focus on customer acquisition. Rather than try to replace Netflix from day one, Disney's low monthly price means that it is happy co-existing with Netflix - initially. Considering that a blu-ray box set for Star Wars sells for the rough equivalent of two years' worth of Disney+, Disney is banking that the service will be a "must have" add-on rather than a consumer's main service out of the gate. The strategy is aimed at low-hanging fruit. For example, just about anyone with kids will find Disney's offering to be appealing. I personally have two small children, and Netflix doesn't currently offer anything near the depth of children's content that Disney can - this gap widens as Disney begins pulling its content from Netflix at the end of the year. This is a smart rollout approach to build a competitive subscriber base. Disney has projected/set goals for 60-90 million worldwide subs by 2024. That doesn't mean that Disney is strictly focused on playing second fiddle in the short term. Disney also announced plans to offer a premium bundle at a discount that combines Disney+, Hulu, and ESPN+. This is a more diversified product that will obviously cost more, but will compete for the main spot as consumers' go-to content source. This rollout will take time, and the projected costs reflect this. The rollout of Disney+ will not only cost money as original content is created and added - but Disney is also going to cost itself licensing revenues. Rather than leverage its content to others for revenues, Disney is transitioning to an organic engine via streaming. For fiscal 2020 alone, Disney CFO Christine McCarthy projected that original content will be a $1 billion expenditure, along with another $1 billion in marketing/operating expenses. This cash burn will grow along with subscriber counts, before projected net profitability by 2024. In addition, streaming services Hulu and ESPN+ will also operate at a loss for several more years yet. While investors may scoff at Disney's content budget (which pales in comparison to Netflix's $15 billion estimate for 2019), it's important to remember that Disney's true content creation budget is much stronger than it appears. In addition to original content created for the service, it will also be continually fed with films and shows as they are pumped out by the Studios Entertainment and Media divisions. As content leaves Netflix, pressure will mount for Netflix to provide for itself as it continues to operate at negative cash flow. Not only is Disney pressuring Netflix by removing content, but Netflix will also feel pressure as AT&T begins to pull content in favor of its own streaming service that it's developing. 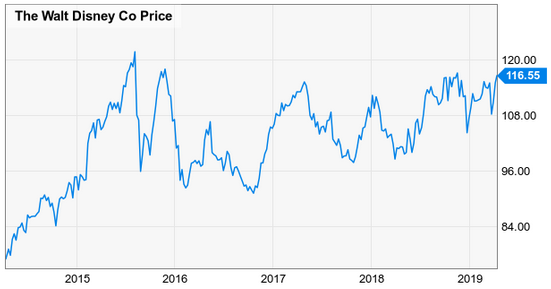 Despite trading near its 52-week highs at $116 per share, the stock has failed to surpass its highs from nearly four years ago. Based on analyst estimates for FY2019 of $6.71 per share, the stock is trading at an earnings multiple of 17.37X. This is in line with Disney's 10-year median P/E ratio of 17.24X. 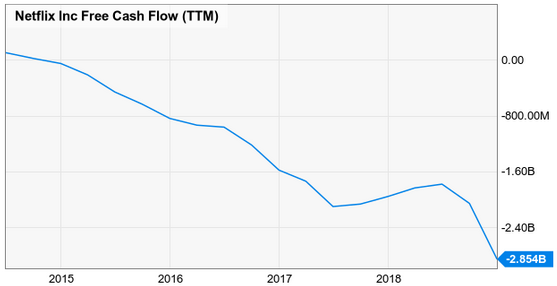 Despite growing revenue at a CAGR of 4.62% and EPS at a CAGR of 13.87% over the past ten years, the market has penalized Disney for its aging media businesses that has seen traditional pay-TV customers migrate to streaming services such as Netflix. We suspect that the short-term investments into Disney+ and some needed deleveraging from the Fox deal may turn off the market to a degree. The company will see a slowdown in earnings growth while it works through these "to-dos" over the coming few years. If the market can look forward and identify the fundamentals for long-term success of Disney+, we believe that a higher earnings multiple is justifiable for Disney. We maintain our projection that Disney could approach $150 per share by the end of the year. The real winner though is the long-term investor that sees the forest through the trees in Disney's direction. It is very feasible that Disney could surpass 100 million subscribers within 5-6 years. The subscription revenues would be enormous (and profitable), and Disney's low price point sets the stage for gradual price increases once it has entrenched itself. We don't project Disney to fetch a PE of 90X like Netflix is currently trading at, but as the service scales and "turns the corner," investors will see a level of growth that will fuel strong cash flows for years to come. If you enjoyed this article and wish to receive updates on our latest research, click "Follow" next to my name at the top of this article. Disclosure: I am/we are long DIS. I wrote this article myself, and it expresses my own opinions. I am not receiving compensation for it (other than from Seeking Alpha). I have no business relationship with any company whose stock is mentioned in this article.